Take up less room on your desk by organizing papers, manuals, magazines and more vertically! Take up less room on your desk by organizing papers, manuals, magazines and more vertically! 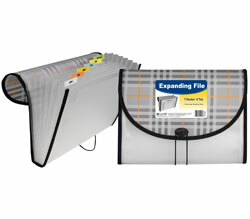 13-pocket expanding file features stand-up design for easy access and extra expansion. Cut-outs on each side make for easy transport. Expands up to 10 inches wide to hold up to 750 sheets of paper or 26 magazines, catalogs, project folders, file folders and more. Divider tabs are on top for trouble-free organization. Includes preprinted tab inserts that are assorted in color. Made from acid-free polypropylene. Letter size. Black.